Çelebi makes significant contribution to Friends of India Association (FOIA). The annual meeting of the Friends of India Association (FOIA), which was established for dealing with Indian Culture and “net working” between Turkish employees and Indian Community and other “expats” living in Turkey, was held together with Festival Diwali in Istanbul. Also aiming to enhance Turkish-Indian mutual commerce relations at business committees, the Friends of India Association/FOIA extends a helping hand for investors who come from India to find partners in Turkey. 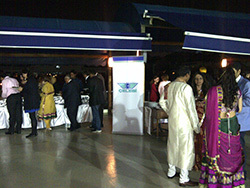 The association also conducts charity events at different locations. This year’s dinner in which high level Indian administrators based in Istanbul, and Turkish administrators who are at decision-making positions in their companies was held at the Turkish Sports Writers’ Association, Levent, under the sponsorship of Çelebi on 26 October 2013. Abdullah Kırımlı, Çelebi Aviation Holding Strategic Planning and Business Development Director; Kubilay Eser, Çelebi Aviation Holding Global Quality Director; Gökhan Üçel, Çelebi Aviation Holding Sales & Marketing Director; and Hayri Güntel; Çelebi Ground Handling Operation Director attended the event.